A Virginia woman who stood by helplessly as two people burned to death in their Jeep Grand Cherokee is hoping an online petition will motivate federal safety officials to order a recall. Jenelle Embrey of Linden, Va., was riding with her father on Interstate 81 in the Shenandoah Valley when traffic slowed to a halt on the chronically-congested highway. Suddenly, they were hit from the rear by a Jeep that in turn had been rear-ended by a tractor-trailer truck that failed to stop. "Once out of our car, I wondered if I was in a nightmare," Embrey said. "I was looking right into the small fire at the back of the Jeep. ... I gestured for my dad to look towards the Jeep as I said, 'I'm okay but those people...' I could hear and see the mom and two teenage boys struggling." Embrey's father ran to the Jeep, broke a window with his fist and managed to pull one of the teen-aged boys to safety. The accident Embrey witnessed is not unique. 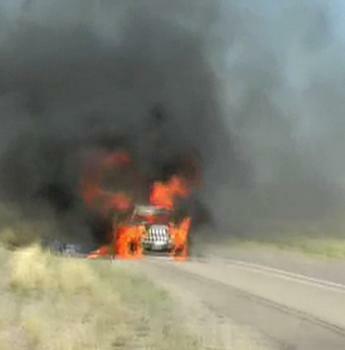 As of late last year, at least 270 fatalities had been recorded in Jeep accidents involving fires. Embrey's petition, addressed to NHTSA and its parent agency, the U.S. Department of Transportation is available on the change.org site. None of this comes as a surprise. It will soon be three years since the Center for Auto Safety (CAS) filed a 69-page petition with regulators that spelled out the problem in detail. The investigation had previously centered on 1993-2004 model Jeep Grand Cherokees but was later expanded to include 1993-2001 Jeep Cherokees and 2002-2007 Jeep Liberty models, the National Highway Transportation Safety Administration (NHTSA) said last June. "The tragic question is how many more fatal fire crashes will it take before Chrysler recalls this Pinto for soccer moms," said Clarence M. Ditlow, the executive director of the CAS, a Ralph Nader-founded non-profit organization, in a November 17, 2011, letter to Chrysler Group LLC Chairman Sergio Marchionne. "The known toll now stands at 185 fatal fire crashes with 270 deaths and numerous burn injuries," Ditlow said. Accidents involving car fires are among the deadliest, for the reason Embrey cites in her eyewitness account. All three passengers in the Jeep were stunned and still in a state of shock. 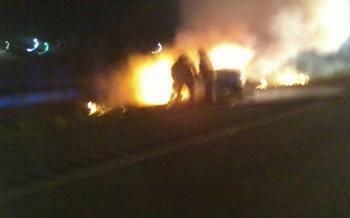 They were unable to rouse themselves quickly enough to escape before the car exploded into flames. "This happened over 3 months ago. I still hear those boys’ screams," Embrey said. "I still smell the stench of burning people. After seeing firsthand how a Jeep can turn two living speaking humans into two dead silent skeletons before our eyes, I am angry that these Jeeps are on the road." "The 1993-04 Grand Cherokee has a fatal crash fire occurrence rate that is about four times higher than SUVs made by other companies," Ditlow said in his October 2, 2009 petition to NHTSA asking for an immediate safety recall. The Jeeps involved in the probe all have their fuel tanks installed behind the rear axle, which could make them more likely to burst into flames following a rear-end collision. Fuel tanks in newer Jeeps are located ahead of the rear axle, a change that Chrysler Group LLC insists was made for design reasons, not because of safety concerns. The expanded review is the final step in NHTSA's process of determining whether a recall will be required. A recall could affect up to 5.1 million Jeeps.